Though it is a legal requirement to wear a safety helmet whilst riding a motorcycle, there are no such laws when it comes to the clothes a rider wears. If you fall off a motorcycle even at 30 mph, sliding on the road surface will rip through normal clothing extremely quickly. Your skin and flesh offer almost no resistance where it will be quickly worn through down to the bone. Abrasion motorcycle injuries are not only painful due to the physical damage produced to the body, but can often be life threatening. Proper motorcycle clothing not only shields against abrasion, but can also have special padding in particular areas which aid in reducing the effects of impacts. Choosing correct and proper motorcycle protective clothing can literally save your life. This motorcycle clothing guide offers the rider tips for using or purchasing the correct riding gear in terms of affordability and safety. Body armour is equipment that is often integrated into motorcycle clothing (though not always) and is used in areas that typically suffer the most damage in an accident; for example, knees and elbows. Body armour can also be purchased as a separate accessory. 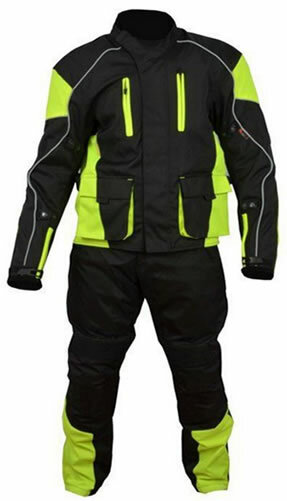 Motorcycle protection clothing comes in the form of a jacket and trousers or an all-in-one suit. Whichever protective clothing you decide to purchase, ensure it is a snug fit but not too tight that is obstructs your movement. It’s essential to try all protective clothing on, and whilst sitting on a motorcycle before purchase. This is to ensure you can reach all controls unhindered. Allow enough room under a suit or jacket so that you can wear a sweater underneath on colder days. A black jacket / trouser set or suit may make you look cool, but is going to significantly reduce the ability of other road users to see you in low-light conditions. Bright colours will get you seen best, but if you must go for black, ensure it comes complete with reflective strips. You may have the best and toughest leather possible, but it isn’t much use if the stitching is inadequate. Stitching on leathers should be at least double, ideally triple stitched to ensure it can withstand an incident. Stitching should also be overlapped by a leather flap or sealed for weather protection. If you come off of your bike and slide, any metal that is in contact with the road surface can generate friction, which in turn generates heat. This heat can be transferred to the skin causing burns. Check that any metal components are covered by leather and that they do not sit directly onto the skin. Good quality leather biker gear will likely last longer than textiles. Offers a certain level of waterproofing depending on quality, though may need some maintenance after time to retain any form of water resistance. Leathers can be soft and very comfortable. Leather gear is often more expensive than man-made textiles and will generally offer less water resistance than textiles. If leathers do get wet, you can become cold and uncomfortable. Depending on the quality, leather dye may run when wet and stain clothes. Leather may shrink when it becomes wet. In days of old, motorcycle clothing made from textiles were simply not tough enough when compared to leather to protect the rider from injury. Recent years have however seen considerable improvements where good quality textiles are comparable to leather, plus offer advantages over traditional leather. Price varies depending on quality, in-built armour and material used. Very tough materials such as Kevlar and ballistic nylon, plus highly waterproof materials such as Cordura are all used in current garments. 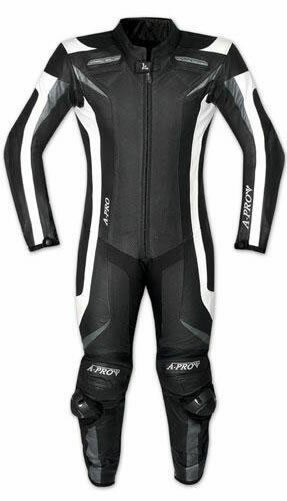 Synthetic textile motorcycle clothing is often a little cheaper than leathers of comparable quality. Certain textile garments can be ‘upgraded’ to include other materials of body armour. Depending on the material, textiles are highly waterproof, colours will not run and the garment will not shrink. Jackets and suits can come equipped with thermal linings ideal for use in cold weather and can be removed when warmer. Air vents are easily incorporated into textiles to aid in cooling the rider. Textiles will not have the distinct look of leathers, though whether that matters is of course an individuals opinion. Textiles may be a little more bulky and less soft than leathers. Where manufacturers claim that motorcycle clothing provides protective properties from injury, they must legally have the ‘CE’ mark. 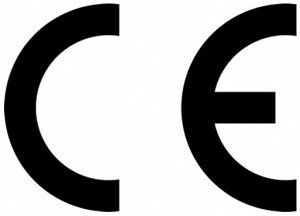 The CE mark certifies that the garment comply with the a particular CE European Standard and have undergone tests that confirm that they are up to the levels of protection that the manufacturer claim. The garment must have a permanently attached CE mark along with a number which indicates the standard that the garment applies to.